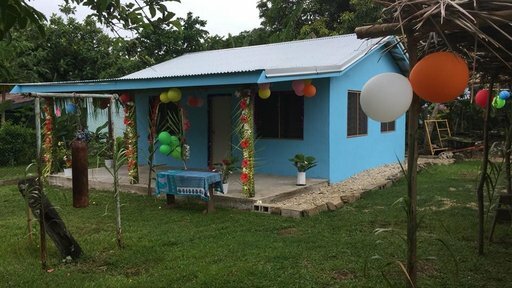 Indeed, a success story for Sergio and his community to have finally completed the Uripiv School Library. The project had its challenges logistically and culturally but Sergio was determined to have the library completed. Challenges such as leaving his work in the classroom to help with the construction, getting materials purchased and shipped to the little island of Urpiv, at times the lack of community support and getting work done with minimal supervision was a challenge. Never the less, the building was completed and opened on the 17th of December 2017. Fredlyn had the pleasure of attending on behalf of Peace Corps, ‘The opening of the completed Uripiv Library was a great joy to attend and the whole time I was sitting in my seat, I felt like getting up and dancing with the mamas because to me, it is a fantastic example of a very well managed project and a great coming-together for the community & PCV and strong leadership. There was great involvement of women in the committee, good community contribution, all labor provided for by the community and of course a resilient and determined Peace Corps Volunteer who saw it through from start to finish. His commitment and motivation to get this library completed despite the difficult challenges is commendable and impressive. He has shown that passion, commitment, determination and strong communal ties will get the job done. We would like to congratulate you Sergio! Thank you for your commitment to help Urpiv School access resources that will enhance the quality of their education and most importantly their learning experiences in literacy!